I was genuinely open to the idea of Britain leaving European Union, you know. The EU does have some truly ugly qualities to it, including revolving around a Friedmanite Central Bank that clearly wants to turn the whole continent into a neoliberalism club. Less so for the red herrings about ‘bureaucracy’, which is mainly a codeword Big Business uses when it means it wants to be allowed to do absolutely anything it feels like, without being accountable. But even there, it has to be said that some of the mechanisms in the EU are rather too Teutonic for the good of humanity. So I have never been against the idea of ‘Brexit’ in principle. But for me to support the idea of withdrawal, I needed to see a coherent and plausible plan for what the UK would do to reform once it had left. Even up to today, the day we hand in notice of our departure, no such plan has ever been presented. No plan as to how British markets would adjust to the loss of priority trade access to the continent. No plan for resolving the issue of having to renew the Northern Ireland border with Eire. No plan for how to police the borders of the UK as a whole when surrendering the co-ordinating advantages the EU gives with police forces in other countries. No plan even for how to carry out the withdrawal process. 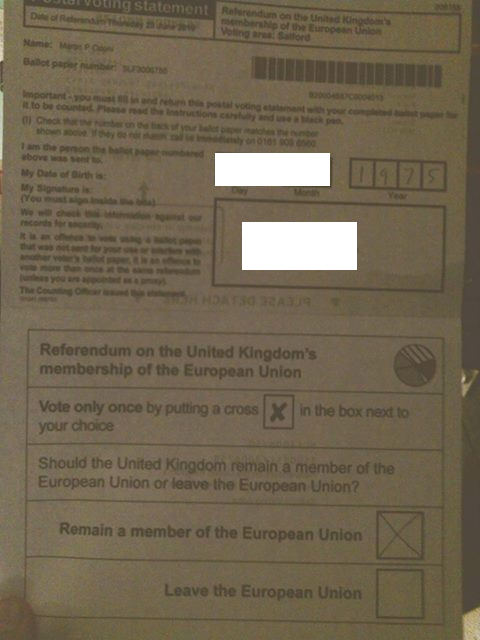 My EU referendum ballot paper from summer 2016, minus a couple of details I have scored out for security reasons. Hence, when the referendum came round last June, I voted to remain. There was, and is, bound to be so much disruption and so many lost advantages, it could only be worth making such a move if we had a clear idea of what we were going to do to adjust, and to this day, still nobody seems quite sure. I simply could not support such a crazed leap into the darkness. My own position since last summer has not really changed. If someone who matters can actually come up with a workable, cohesive plan – and they would have to do so in a big hurry – I would be willing to give ‘Brexit’ the benefit of the doubt, at least for a while. But the sad reality is that I see no sign of that happening. None at all. All that we are really getting from Theresa May’s Government are descriptions of what will happen by default instead. Voting to leave was not stupid in itself, but voting for it, when it was totally unclear what shape the process or outcome would take, was an incredibly high risk for little gain, and therefore reckless. But many Leave voters still seem startlingly over-confident that ‘Brexit’ is going to be the best news that the country ever had. They treat every development as confirmation of the onset of paradise, even when the opposite reality is grossly obvious. For instance, I have seen Brexiteers on social media happily telling all-and-sundry it is absolutely fine that David Davis MP, the ‘Brexit Secretary’, has not even assessed the likely impact of Britain leaving the EU without securing a new trade deal. This ‘oversight’ (a little like calling the atomic strikes on Hiroshima and Nagasaki “an unusually hot summer”) is one of the reasons why negotiations are failing to take any coherent shape, as presently, British representatives are not sure exactly what sort of deal to work for. What causes this ‘Brexit-at-any-cost-has-to-be-better-than-what-we-have’ attitude? Part of the problem is just flat-out xenophobia, the instinctive unease of knowing that your country is part of something far larger. It can be forgiveable for seeing this relationship as one of a colony controlled by a conqueror, even though Britain has in practise been allowed considerable leeway over which EU rules it must follow – not compelled to join the Eurozone or the Schengen Area for instance (those who voted to leave because they wanted stronger control on immigration never seem to realise that our borders remain regulated) – and has also exercised a strong influence on EU legislation. The other part of the problem is the ‘Good-ole’-days’ delusion that many, especially in ‘Little England’, have that Britain was a better place before joining the European Economic Community in 1973, and that this move was what ended the country’s old status as a ‘great’ nation. The truth is very different. 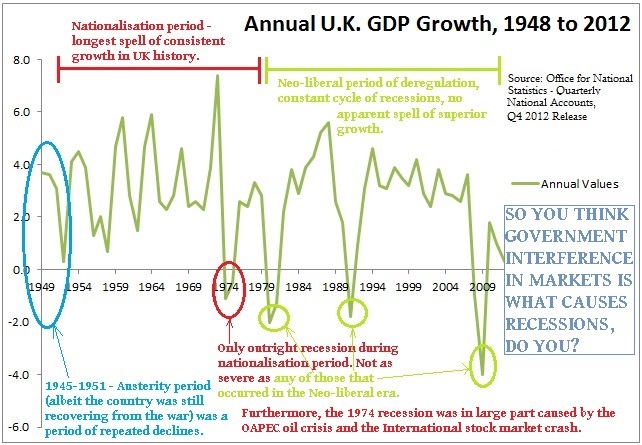 In world terms, Britain had been in an inevitable decline since early in the Twentieth Century, having been stagnant since late in the Nineteenth. Two World Wars in the space of thirty years exhausted the country militarily and economically, and left it almost powerless to retain most of the colonies it had accumulated over the previous two centuries. As it struggled to adjust to the dismantling of the British Empire, the UK could no longer obtain vast resources without the inconvenience of having to give something back in return for them. Dependence on legalised theft was replaced with dependence on trade, especially imports, all of which were subject to tariffs and customs bureaucracy. Indeed, given the troubles of losing an Empire, it is a remarkable testament to the ingenuity of the social democratic consensus of the post-war era that, at the very least, the economy of Britain managed to remain unprecedentedly stable. But this stability simply softened the pain of lost prestige and power, and these losses inevitably made Britain more vulnerable to prevailing international conditions. So in fact, joining the EEC gave Britain a useful boost, as it gave the country cheap, relatively tariff-free access to a very large foreign market. What is more, given 1973 was also the year of the First OPEC Oil Shock, it arguably happened in the nick of time. Whether that is precisely true or not, the inescapable reality is that joining the EEC had no bearing on Britain’s decline; it began long before the Community had even been thought of. If anything, joining the EEC helped arrest the slide; the discovery of North Sea Oil did the rest. And there is no way the British are going to get the old Empire back, or become a great power of the type it was before the World Wars. People looking back to the largely-fictitious ‘good-ole’-days’ are pining for something that is simply never going to happen. Irrespective of whether it would be morally right or not to re-establish the British Empire (and of course it would not), it just is not a possibility. Britain’s military in the modern era, while still significant, is completely dwarfed by some of the world powers of today, and those other powers will not allow Britain to embark on a fresh campaign of conquest and colonisation. The booming industrial powers of India and China, for instance, are former victims of the British Empire, albeit in different ways, and remain permanently against it ever coming back. No, Britain is going to have find its way in the wider world without the violent old short-cut of taking-without-asking. The sad aspect is, in joining the EEC/EU, it had already found a pathway to doing so. But now it has decided to step off that path without firstly making sure the ground around it is solid enough to take its weight. None of this is to say that doom is a certainty. We might yet make the best of this if someone can come up with a workable plan in a hurry, instead of scaremongering about foreign bureaucrats, or making jingoistic false promises about ‘more money for the NHS’. Perhaps, in the very long term, leaving might even prove to be better than sticking with the EU, if the departure is guided correctly. But if the process of withdrawal continues on its present, erratic, thrashing heading instead, we are going to be in for some very, very hard times in the coming months. With the unguided action it takes today, Britain is committing itself to a perilous course into the unknown. Without either an Empire or the EU, Britain needs something else abroad to prop it up, and so far, no one has suggested anything likely to do the job. After lengthy investigation – and it would appear some very reckless and unjustified arrests in a big show of looking ‘in control’ – the police have concluded that the Westminster Attacker, Khalid Masood, acted alone when he took the lives of five people this week. The media, and many in the wider public, seem to have determined for themselves that Masood, nèe Adrian Ajao, was a Radical Islamic terrorist operating on behalf of the Islamic State of Iraq & Levant (ISIL/’Daesh’). That is a perfectly understandable conclusion to draw. Although born and raised a Christian, he converted to Islam at some point probably between 2001 and 2004. His method of killing, involving driving a vehicle into a crowd of people on Westminster Bridge, has very loud echoes of last year’s attacks in Nice and Berlin. And of course Daesh have claimed Masood as one of their own, calling him “a soldier of the Caliphate”. Open-and-shut case then? Daesh claims Khalid Masood was one of its soldiers. Firstly, after the aforementioned investigations concluded that Masood acted alone, it is perhaps a little difficult to reason exactly how or when he had been radicalised. For one thing, radicalisation is not exactly unknown among middle-aged men, but younger men are far more vulnerable to it. More importantly, it is a little incongruous that Masood supposedly joined a movement that radicalised him, but then he acted completely independently of it. When and how did it happen? He is understood to have spent a couple of years living in Saudi Arabia teaching English, but that appears to be the closest he ever got to the heartlands of Radical Islam. He did feature in a counter-terrorism investigation into an extremist group some years ago, but he was very much a peripheral figure, and it was before Daesh had even existed in any event. He may have had very loose associations with radicalised individuals, but the truth is that we can find ways of saying that about almost anybody. There really is no firm indication that Masood was ever ideologically radicalised. Secondly, it is high time everybody grasped that just because Daesh claim a crime as one of their own, that does not mean that it genuinely is. Daesh wants the world to fear it. It especially wants Western countries to be afraid, as it hopes to intimidate the West into abandoning ‘The Holy Land’. Therefore, so long as it sounds plausible, Daesh will always claim these sorts of crimes as their own; it makes the organisation sound like more of a threat than it really is. But the reality is that the investigations have found no direct, practical link between Daesh and Masood. He might well have carried out the attack as an act of support for Daesh, he might well have done it after being inspired by Daesh (although actual evidence for either has not yet been uncovered), but the signs are that he did not do it as a part of their organisation. He did not appear to act under Daesh’s specific instructions, he certainly did not act in co-ordination with Daesh. Nor indeed did he act in co-ordination with anyone else. He acted alone. It is only by appending a very, very broad definition of what constitutes a member of Islamic State that the claim can really be sustained. Analysis of Masood’s history suggests a man with serious problems controlling violent and criminal impulses, dating back to long, long before he became a Muslim. He spent three terms in prison, all before he converted to Islam, including twice for stabbing victims in the face with knives. In both cases, it seems more-than-possible that the attacks were intended to be lethal, but also they foreshadow his killing of PC Keith Palmer on Wednesday. Masood further had an extensive history of substance abuse, including cocaine and steroids, which were bound to have long-term effects on his mental health. Perhaps paradoxically, after his conversion, he for some years showed signs of bringing his behaviour under control. So while Radical Islam is one strong possibility, another strong possibility cannot yet be ruled out. If we look at the Westminster Attack in the context of the rest of Masood’s life, instead of in the context of popular hysteria against Muslims, we see an equally consistent pattern. The possibility is that Khalid Masood was just an unstable man who, having spent some years battling to bury old impulses, finally reached the end of his tether. He may simply have been carrying out a mindless act of last-gasp despair similar to the massacre by Derrick Bird in Cumbria a few years ago. We really do not know why Masood did what he did on Wednesday, and as he was gunned down, the odds are that we never will. Without finding more information first, any attempt we make to fill that void will be a mixture of prejudiced speculation and fevered guesswork. Such an exercise is not only futile, it will potentially blind us to better information, should it become available. In the end, such impatient guessing games will only reveal more about the people playing them than they will ever reveal about Khalid Masood. So, the likely identity of yesterday’s attacker at Westminster has been unveiled. He was a man going by the name of Khalid Masood. One problem, and it is a very familiar one. Yes, he was a Muslim, I will grant you that. But the thing is, he was not from Syria. Nor from Yemen, nor from Saudi Arabia, nor from the wider Middle East. Come to that, he was not even from abroad. Khalid Masood was in fact born in the rolling desert wastelands of sun-scorched… Kent. He was living in the mighty, oil-rich Arabian Sheikdom of the West Midlands at the time of his death. He had a record of non-political crimes as long as the average elephant trunk, and that record arguably raises doubts about how appropriate it is even to call the attack yesterday ‘terrorism’. He may just have been a very unstable man who lost control of himself. In truth, terrorism has a very broad definition, and his crime of killing five people, while horrific, is not noticeably worse than, say, Thomas Hamilton at Dunblane, or Derrick Bird‘s rampage in Cumbria. Neither of those atrocities are seen as ‘terrorism’, even though they took more lives. The reason I call Masood’s nationality ‘a very familiar problem’, by the way, is the historical pattern of terrorist attacks in the name of Radical Islam. Even if we are to assume that this was indeed Masood’s motivation – and we have yet to see any firm evidence that it was – that history shows that Radical Islamic terror, quite simply, does not cross borders all that much. The 9/11 attacks on New York and Washington DC may give the impression otherwise, but in practice, the majority of atrocities are committed by people who originated in the country where the attack is taking place. These include most (though not all) attacks in Europe. The Paris Attacks of November 2015, for instance, were not carried out by Syrian refugees, but by French and Belgian nationals. As another example, the London Bombings of 2005 were carried out by a group of radicalised and foolish young men from Yorkshire. This pattern is cardinal, as many people misunderstand the plural nature of Radical Islam. It is not a single, coherent organisation, or even two or three organisations. There are hundreds of very small military groups, and while they share an ideology – based on the Wahhabist ideas of an Egyptian academic called Said Qutb – they have little to do with each other on any practical level. Most of these groups’ goals are very localised, and can even contradict each other’s. (Where the goals are international, they are more about trying to intimidate Western countries against interfering in ‘The Holy Land’ than trying to destroy the West.) So when an attack happens in Europe or the USA, it is far likelier to be by someone from Europe or the USA in the first place, than by someone from the Middle East. This is why I have argued, and will continue to argue, that the constant, self-absorbed and paranoid hysteria in the media and the wider British public against refugees, is as much futile as it is deceitful, hyperbolic, and cruel. Closing borders to refugees altogether – and let us not forget while the Radical Right bemoan our largely-mythical ‘open borders’ just how few refugees Britain has taken in during the post-‘Arab Spring’ crisis – will have very little positive effect, and considerable negative effect. It is very unlikely indeed to stop terrorists getting into the UK, because any terrorists we are at risk of facing are probably already here, and have probably lived here all their lives. Far from protecting anybody, all it is likely to achieve is increased stigma felt by many desperate people, and thus raise the chances of them becoming radicalised too. Turning away refugees is like trying to heal a broken bone by kicking it. It does not matter what Nigel Farage or Katie Hopkins want viewers of Fox News Channel to think about this. Khalid Masood was not a refugee, and what happened in London yesterday does not add any weight at all to the case for banning refugees (such as there is one). I earlier put up a small plea-for-calm over today’s atrocity in London. That plea still stands, but I have few extra points and clarifications I would like to add. Firstly, more information is now available, including a clear order of events. Contrary to my earlier understanding, the attack was carried out by one person acting alone, and it began, not ended, with a car driving into a crowd of people on Westminster Bridge. The driver then got out of the car, and tried to enter the Palace of Westminster, where he was intercepted by a police officer. The assailant stabbed the officer with a knife before being gunned down by two apparently plain-clothed officers. There is no evidence of an accomplice. The death-toll currently stands at four, including the police officer and the attacker, and it is to be hoped the toll goes no higher. The necessity of my earlier plea-for-calm has been demonstrated in the hours since. Between Tommy Robinson of English Defence League infamy taking the opportunity for some Islamophobic rabble-rousing, histrionic doubtful accusations against a man who is apparently in prison, and some classic, barefaced Western hypocrisy, the aftermath of the atrocity has been predictable in its want of thought. Regarding Robinson, nothing I can say about this evil little man will not already have been said by others. But it was beyond crass of him to talk of the nation being ‘at war’, not least because what wars Britain fights it does so at its own choosing. And it makes that choice with depressing and imperialistic frequency. Regarding the doubtful accusations, the rumour is circulating that a notorious hate-preacher, born under the name of Trevor Brooks, but nowadays going by the name of ‘Abu Izzadeen’, is the dead attacker. This may potentially come as a mighty surprise to Izzadeen. It certainly did to his solicitor, who insists that Izzadeen is currently in prison, and still breathing without difficulty. Dominic Casciani of the BBC seems very confident about that too. Izzadeen’s ongoing imprisonment has not yet been confirmed by the Metropolitan Police or the Ministry of Justice, so there is still an outside chance that he was the attacker. But it can be taken as a sign of nervous over-eagerness that Channel 4 News, the source of the rumour, has jumped the gun quite so wildly. And finally, the Western hypocrisy. Sean Spicer, Press Secretary to US President Donald Trump and God’s gift to Melissa McCarthy’s comedy career, gave a briefing to the media earlier, in which he rolled out the usual sentimental clichés about full co-operation, and formal condolences, and support and so on. He also stated that the White House condemns “today’s attack in Westminster”. I am unimpressed that ‘Melissa’ has the effrontery to condemn such an attack, today of all days. After all I have seen not one example of anyone at the White House condemning an attack carried out in Syria yesterday, one that had a death-toll over eight times higher than the one in London. Why would that be? Could it be because the victims yesterday were Middle Eastern and not Westerners, and therefore their lives were prejudged to be ‘less valuable’ than those of Europeans? It is partly that, I am sure. But I think the main reason is that yesterday’s attack was carried out by jets allied to the US Air Force. Therefore it does not ‘count’ as an atrocity, but merely as a ‘misfortune’, one to be treated as an afterthought. Every non-white crime in a western country is one that shouldn’t have happened at all as the non-whites shouldn’t be here. Beyond the unsupported nonsense that a person’s right to be in the UK is dependent on their skin colour, and the debatable assumption that the attacker was not white, I was equally contemptuous of the ignorant hypocrisy. How many crimes of extreme violence have white people committed in the Middle East? Such as the one yesterday? How long have white people been in the lands of the Middle East, mainly in order to control the flow of the region’s vast oil reserves, and how often have their Governments shown a casual willingness to use force there to maintain that control? For over one hundred years, and with terrible frequency. Is that not one of the major reasons why radicalised Muslims tend to commit atrocities in the first place? Surely every white crime in a Middle Eastern country is one that should not have happened at all, as the whites should not have been there? It is a lengthy catalogue of such crimes, not least by the US Air Force. Just ask Medecins Sans Frontieres. But as I say, in too many Western minds, these crimes do not ‘count’. Atrocities are only atrocities when carried out against the West, not when they are carried out by the West. It comes to something when we need the Joker to point out what hypocrites we are. Someone armed with a knife has stabbed a police officer in the vicinity of the Houses of Parliament. A couple of plain-clothed officers appear to have shot the assailant while he was running away from the scene. The assailant may have had an accomplice waiting in a car nearby. The possible accomplice appears to have run some people over as he drove off. The incident sounds very ugly indeed, but as far as we can tell at present, only one life has been lost. One life lost is one life too many of course, but it is hardly on the same scale as the day-to-day atrocities experienced in Iraq for the last fourteen years. It may not even be a ‘terrorist atrocity’ in the accepted, political sense of the term. The Metropolitan Police say they are treating it as a terrorist incident, yes, but only until they get indication otherwise. Therefore, everybody, please let us have no jumping of the gun, or panic about the attack in Westminster. Please let us have no knee-jerk “CLOSE THE BORDERS NOW” responses from xenophobes who naturally just assume every time something violent happens, “It must be the Muslims!!!! !” It is imperative everybody waits to see what has really happened, without looking to apportion blame or demanding action taken that may make matters worse. I would also ask people to remember that this would be seen as one of the least violent days in recent memory if this were the only attack that had happened today in, say, Yemen or Syria. European lives are not, ipso facto, more important losses than Middle Eastern lives. Therefore, I hope that this incident is treated with some measure of proportion by the media, and we do not get the tasteless saturation coverage that tends to happen when these horrors happen in Europe and North America; incidents several scales greater than these are often left in the small print in the Western media when they happen in Africa or the Middle East – when they are mentioned at all. This suggests an unconscious racism that fuels the same xenophobic/Islamophobic outrage when they happen in the West. Let us keep the outrage, and the racism, under control, and let facts drive our response instead. Three more deaths have now been confirmed. Also, I have received several comment-submissions on here that I have chosen not to approve. I normally prefer to allow non-spam comments, subject to initial review, but the two I am discussing here make exactly the sort of racist, knee-jerk assumptions this article is warning against. Under the circumstances, it seems inappropriate to approve such comments and debunk them, as is my usual approach, so I have simply rejected them. PLEASE, if you are a xenophobe or racist who wishes to cash in on this atrocity, do not bother trying to do so on this blog. Your comments will not be approved. Philip Hammond, the finest Chancellor of the Exchequer since… well, since… erm… um… well, he is somewhat less awful than George Osborne, I suppose. Philip Hammond, the Chancellor of the Exchequer who is somewhat less awful than George Osborne, was today forced into a humiliating climb-down. In last week’s Budget, he announced a rise in National Insurance contributions for self-employed people. Today, after just seven days of pressure from all corners of the House of Commons including many in his own party (some of whom are themselves self-employed, let it be noted), he performed a sharp U-turn. During last week’s Prime Minister’s Question Time, Labour leader Jeremy Corbyn really went on all-out attack, starting the ‘domino effect’ of opposition that brought about today’s climb-down. The reality is that this is one of Corbyn’s best victories since becoming Labour leader eighteen months ago. So, what congratulations did the media decide to bestow upon him in acknowledgement? …the Labour leader… was the one looking uncomfortable by the end of his weekly clash with Theresa May. Many thought PMQs would be a bloodbath, with Labour landing most of the punches… However, they forgot one thing: that Jeremy Corbyn is the leader of the opposition. A compete abrogation of the duty of the Leader of the Opposition. Corbyn failed dismally to exploit this at the dispatch box. And so on, and so forth, and yada-yada-yada. Read the mainstream media (something I only do with the utmost caution), and you would think that Corbyn has just fallen to his worst defeat. It is frankly breathtaking that the media have decided to find a way to attack Corbyn yet again, even as he has played a key role in forcing a Government U-turn. It is as contrary to the facts as the popular British myth that “Dunkirk was a great triumph”. The determination, especially of the shamelessly aristocratic Kuenssberg, to insist that absolutely anything and everything Corbyn does must be wrong even when it works perfectly seems almost quasi-instinctive now. It cannot be just stubbornness or orchestrated bigotry against the ‘real’ Left anymore, it seems to be just unthinking, ingrained habit. As soon as the media see Corbyn getting out of his seat to speak at the despatch box, they simply assume before he has drawn a breath that he is about to do a bad job, and then find a way to confirm it to themselves. Sure, they probably really do want to make sure Corbyn gets no credit when he deserves it, but it happens so routinely that it has almost ceased to be premeditated. So apparently, Britain’s media imagine cheap point-scoring in a staged slanging match is much more important than getting a bad policy reversed. Has Britain truly become this shallow?